Solar powers appliances, electric heat pumps and an electric car for carbon-free living! 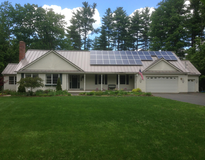 $0 down loan through the Mass Solar Loan program with only 1.45% interest rate for 10 years! I replaced my oil-fired heating system with electric heat pump mini-splits which are super efficient and provide both heating and air conditioning. I also have an electric car. Since I sized the solar system to cover the electrical demand of all of these, carbon-free solar power can meet all of my energy needs. Climate change is the biggest challenge facing the world. Reducing one's energy use, switching to electrical power, and then providing that power with renewable energy is the basic approach to addressing greenhouse gas emissions. It's great to be able to take these actions and feel like you're making a difference. The incredible economics of clean energy is icing on the cake! If you're thinking about solar, take advantage of the opportunity to make sure your home is as energy efficient as possible, and then look for opportunities to use the solar to power more than just your lights and appliances by switching to an electric heating or hot water system and electric car. You'll have the biggest impact (and save the most money) by putting it all together. Make sure you're clear on what you're getting and what to expect for the process. Be patient with the process--it take a while but it's worth it in the end! Installers are very busy and communication can be inconsistent, hence the recommendation to get as much figured out at the start with a clear plan to implement. Happy to talk about my experience in any of the clean energy technologies--feel free to drop a line through EnergySage if you'd like to get in touch!